Romana brushed travertine is a characterful stone which we supply in the OPUS tiling pattern as well as 610x406x12mm. The four sizes in the pattern interlock and then repeat across the floor The finished product appears random to the eye, and the different colours in the tiles look very effective spread throughout the floor. The larger format single size can be tiled in a conventional or off set brick pattern. 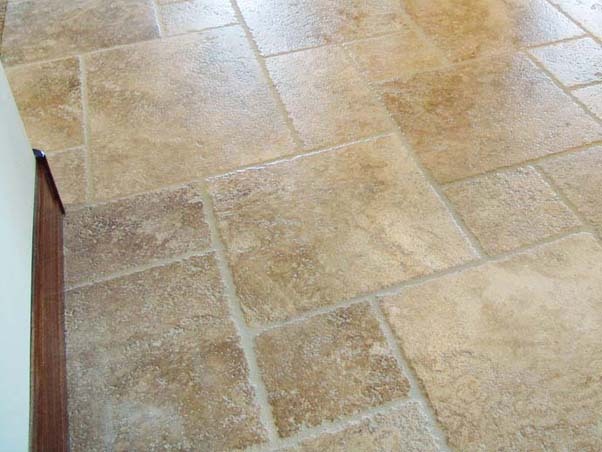 Brushing the surface of the stone creates a very high quality, slightly rippled, and durable finish. The diamond tipped brushes have a mild polishing effect which gives the stone a soft satin finish. The chipped edges create a beautiful antique detail, adding to the quality and emphasising the effort which goes into producing this floor.